The Baker defense makes one of its five sacks on Evangel quarterback Blake Woodard on Nov. 12 at Liston Stadium. 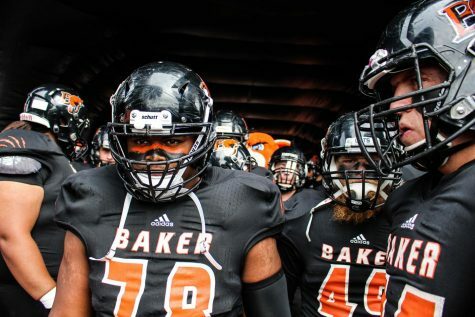 The win gave Baker its first 11-0 start to the season in school history. Image by Shelby Stephens. Head coach Mike Grossner was splashed with Gatorade as the Wildcats celebrated their 46-13 win over Evangel on Saturday afternoon. Grossner is getting used to celebrations, but this one still held special significance. “How many times are you going to get to celebrate an undefeated season?” Grossner asked. The No. 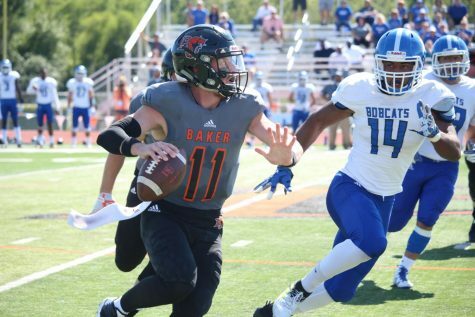 2 Baker Wildcats are perfect through their first 11 games of the season and are the first team in program history to start a season 11-0. The Wildcats will now play in the NAIA FCS Playoffs for the fourth time in the last five years after capturing the Heart of America Athletic Conference South Division title. 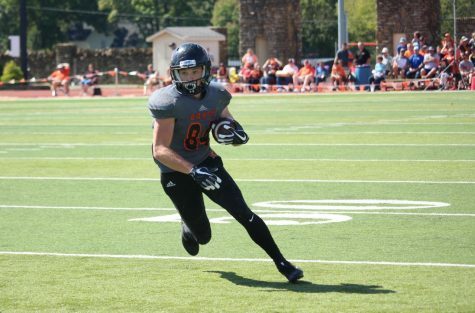 The Wildcats will host Sterling College on Saturday at Liston Stadium. This is Baker’s third conference championship in the last four seasons, but this is the first season that the Wildcats will finish with the conference’s best overall record in that stretch. 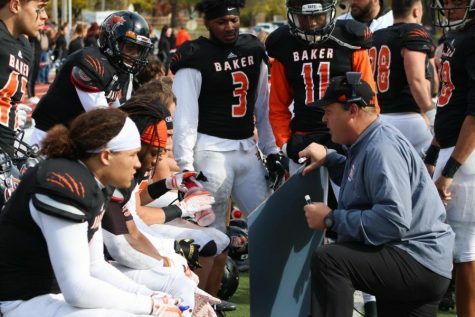 Baker is the first Heart champion to win its first 11 games of the season since 2012, when Missouri Valley started the season 12-0. The Wildcats captured the Heart South Division title for the second consecutive season with an unblemished record against Avila, MidAmerica Nazarene, Central Methodist, Missouri Valley and Evangel in the final five weeks. 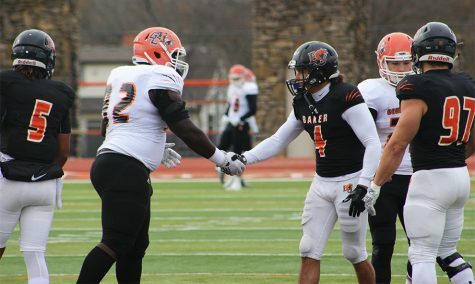 The division title gives Baker an automatic bid to the NAIA FCS Playoffs. The start to Saturday’s game was slow for Baker. The Wildcats only led Evangel 14-3 at the half and struggled early on offense. The Wildcats woke up in the second half and outscored the Crusaders 31-10. Junior quarterback Logan Brettell threw three touchdown passes in the second half. “Logan (Brettell) was a little off in the first half,” Grossner said. Sparked by a big day from Brown, who scored two touchdowns, the Wildcat rushing attack kept Baker’s offense moving. For only the second time this season, the Wildcats had more rushing yards than passing yards. Brown led Baker with 153 yards on 21 carries, and senior Adonis Powell carried the ball 12 times for 74 yards, including a first-quarter touchdown run. 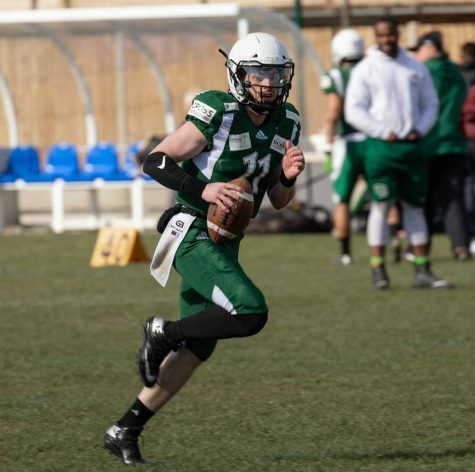 The air raid opened up in the second half with Brettell striking the Crusader defense for touchdowns of 44, 8 and 12 yards to senior Damon Nolan, sophomore Jaylen Rose and senior Quanzee Johnson, respectively. “Just like we’ve done all year, we had good adjustments at halftime and came out better in the second half,” Brown said. 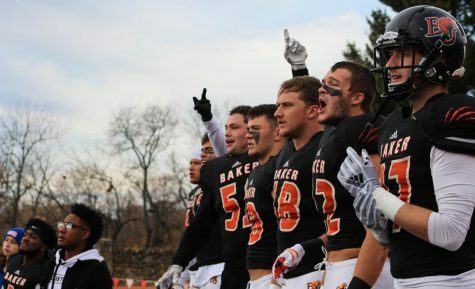 The visiting Crusaders’ only touchdown came against Baker’s second team, and their last field goal came after a pass interference penalty moved them into field-goal range with no time left on the clock. Baker allowed only 55 rushing yards thanks to big days from linebackers Kharon Brown and Mikeice Adams with 18 combined tackles. 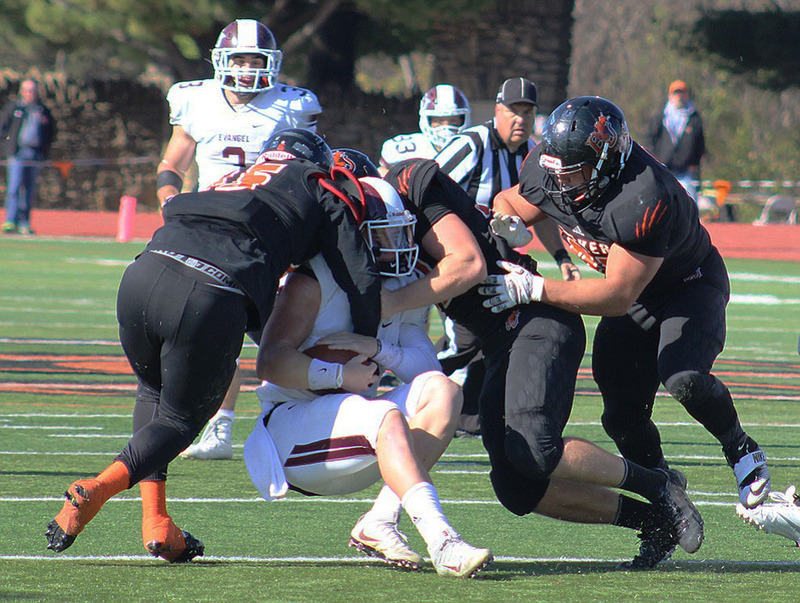 Senior Nick Becker added three sacks for the Baker defense. The Wildcats’ first-round playoff game against the No. 13 Sterling College Warriors will be played Saturday at Liston Stadium, but the starting time has not yet been announced. With their No. 2 national ranking, the Wildcats have a chance to be the host team in the first three rounds of the playoffs. Sterling College finished the regular season 8-2 overall, with a 7-2 record in the Kansas Collegiate Athletic Conference. Sterling finished in a tie for second in the KCAC, behind Tabor College at 8-1. The Warriors come into Saturday’s game on a six-game winning streak. 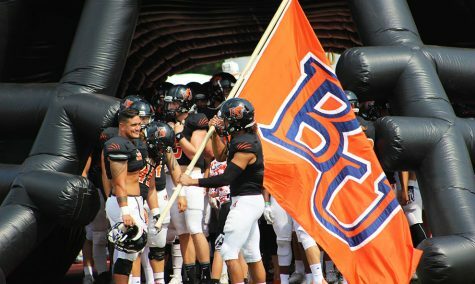 The Warriors and Wildcats met in the first round of the NAIA FCS Playoffs in 2013, when Baker won 10-7 on a cold day at Liston Stadium. Sterling and Baker last met in week two of the 2014 season, when Baker held on to win 31-30 after holding a 24-7 lead at halftime. The Wildcats have their goals set high for the postseason and expect to make a deep run in this season’s playoffs.